Pawn your Marc Chagall Painting & Art | Loans on Marc Chagall Paintings ! You may be asking yourself, “where do I pawn my Marc Chagall art & paintings in London?” New Bond Street Pawnbrokers has over 25 years of experience brokering luxury assets, with a specialist interest in brokering fine art to exclusive clientele. Release your funds with loans on Marc Chagall art and paintings with our team of award winning experts in London. Marc Chagall (1887 – 1985) was a celebrated Russian-French Modernist painter, glass painter, and sculptor noted for working on a synthesis of Cubism, Symbolism, and Fauvism. Robert Hughes called Chagall “the quintessential Jewish artist of the twentieth century,” and Chagall was inspired by Eastern European Jewish folk culture. While his work predates Surrealism, it is largely inspired by a similar dedication to the symbolic, poetic, and emotional, resisting the logic and line of the pictorial. At a young age, Chagall moved to Paris, then fled to the United States as a refugee during World War II. He travelled widely later in life, and is known for his use of colour, expression, and employment of a diverse range of mediums. 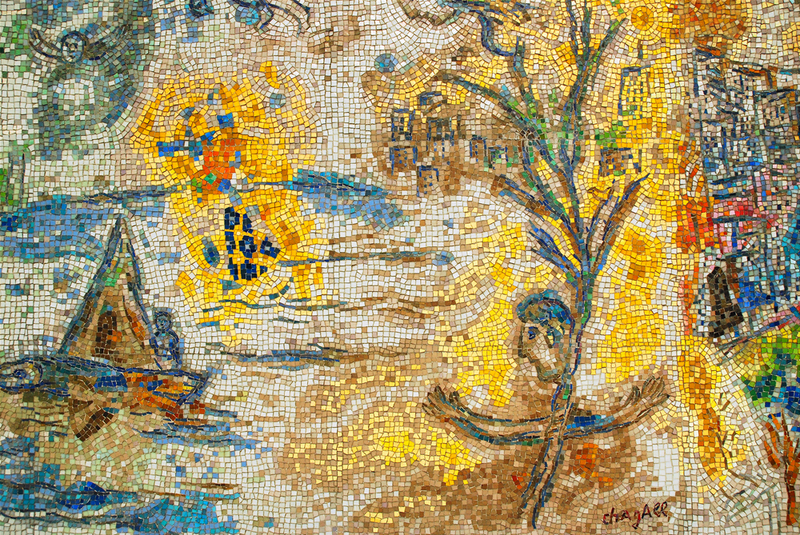 Chagall was commissioned to create artwork for the ceiling of the Paris Opéra, murals for the Metropolitan Opera House, New York, and a window for the United Nations building, New York. The artist’s work was exhibited at the Musée du Louvre, Paris in 1977. He provided illustrations for Gogol’s Dead Souls and the Bible. New Bond Street Pawnbrokers has a dedicated team of financial, fine art, and loan brokering experts dedicated to discretion. Access the capital of your Marc Chagall art without selling your masterpiece outright. Release the capital contained in your art collection with loans on Marc Chagall art and paintings. In November 2017, Chagall’s 10-foot-wide Le Grand Cirque (1956) sold at Sotheby’s for nearly £12 million during the longest contest of the night – 6 minutes during the auction house’s Impressionist and Modern art sale. In the same sale, Chagall’s Les Amoureux (1928) was the evening’s top sale at £22.3 million. Both sales broke Chagall’s 30-year-old £11.6 million auction record. This record was set by Chagall’s oil painting the Anniversaire (1923) at Sotheby’s in 1990. Chagall was a prolific artist and lived to nearly 100 years old, with most of the material on the market from his later years. As of 2017, his most inexpensive work to go on sale (according to the artnet Price Database) was the lithograph La piège (1962) for £2,900 in 2000. Will New Bond Street Pawnbrokers pawn my Marc Chagall paintings, sculptures, and etchings? Chagall was a pioneer of modernism, working in Paris during the “golden age”. New Bond Street Pawnbrokers employ a wealth of world-class experts to guarantee the best price for your collection. Chagall was strongly inspired by his childhood, his love of his home city, Vitebsk, and symbols and ideograms. Chagall’s art inspired his contemporaries as well as succeeding generations of artists, critics, and collectors. Chagall himself was an admirer of Renoir, van Gogh, and Pissarro, and his oeuvre is essential to understanding the wider body of work produced by the icons of the Modernist and Impressionist movements. Release the capital of your luxury and influential Marc Chagall asset with New Bond Street Pawnbrokers. We understand the value of your Chagall art, as well as Chagall’s influence, richness, and diversity. For more information on services provided by New Bond Street Pawnbrokers please watch our video here and read about the loan process here. Some of the many artists we loan against include Andy Warhol, Bernard Buffet, Damien Hirst, David Hockney, Marc Chagall, Raoul Duffy, Sean Scully, Tom Wesselmann, Tracey Emin, Banksy, and Roy Lichtenstein to name just a few.